Home Sweet Home is a radical and highly creative campaign to force political action on Dublin homelessness; a revolutionary criticism of Ireland’s broken housing market, booms, busts and corruption. 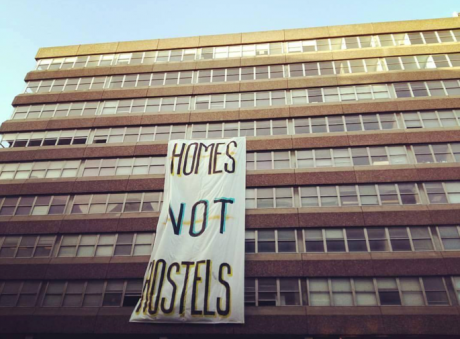 The Home Sweet Home (HSH) story broke on 16 December 2016 when the campaigners squatted Apollo House, a large vacant office block in Dublin’s city centre. Empty for years, Apollo House was another vacant remnant of Ireland’s housing boom. Like many hundreds of other Dublin buildings Apollo House was managed by an Irish government agency called the National Asset Management Agency (NAMA). NAMA had sat on the property for years while private capital circled overhead. Vulture property funds waited for the right price to pounce. 2016 marked the centenary of Ireland’s 1916 Easter Rising. 100 years ago activists and celebrities also combined forces. Celebrity involvement gave HSH activism access to the conservative mainstream media. Activism on homelessness doesn’t play well in the Irish media where photos of overpriced housing fill weighty weekly property supplements, but media has an addiction to celebrity. Combine celebrity with a canny social media strategy and you have a winning combination. HSH has had an extraordinary impact in a very short time. 100 years before, a secretive organization, the Irish Republican Brotherhood (IRB) used many similar tactics to drive political change. The IRB spawned Sinn Féin and the Irish Republican Army (IRA) and brought Dublin headlong into a bloody revolution that was an abject failure but eventually led to separation from the British Empire. Poetry and political theatre have long been absent in Irish activism; Home Sweet Home welcomed them back to great effect. HSH too exhibits a winning blend of artists and non-violent activists. Their occupation of prominent city centre buildings and their ability to self-publish gives them visibility – but culture was key. In 1916 the cultural element was provided by live theatre, in 2016 the medium was video. The IRB also published daily bulletins and hand-printed proclamations. HSH used Facebook and a Youtube channel. Poetry and political theatre have long been absent in Irish activism; Home Sweet Home welcomed them back to great effect. Ireland’s on-going financial crisis began, along with the rest of the world’s financial system, in 2007. Ireland’s credit-driven property boom abruptly ran out of credit. All hell broke loose. That credit glut began in the late 90’s and accelerated till 2006. With financial regulation essentially absent, excessive borrowing by Irish banks sped up even more with the advent of the euro. When Irish banks ran out of money to lend they made more by selling bonds to German, British and other investors. These bond-holders fuelled even more lending into the saturated local housing market. Real-estate agents said prices could only go up, Ireland was different. They were wrong. During the property boom Irish residents were forced into an ever-shrinking supply of ‘affordable’ housing. The drastic reduction in investment in social housing and massive mortgages spiked rents. Orthodox economists model government expenditure on public housing as a distortion of the housing market. Strangely, banks loaning money to developers, while also selling mortgages to their buyers, is OK. Gamblers call such a strategy playing both ends against the middle. Again economists were drastically wrong, their theories quasi-fatal to the Irish economy. But, despite this, the same doctrine drives local housing policy. Paradoxically, one legacy of these failed policies is Dublin homelessness in an environment of huge availability of vacant housing, because that supply is off the market. When the Celtic tiger ran out of cheap euro credit, property prices collapsed about 60% from peak. Ireland’s developers were leveraged to the hilt; they defaulted on their loans and brought down the Irish banks. Those banks had accepted property as loan collateral from developers before the crash. They were also suffering extensive mortgage arrears; much of those defaulted mortgages have been sold on to vulture funds; the vulture funds also saw an opportunity in buying the property once held by the banks as collateral. The collapse of the finance sector led to a disastrous government intervention socialising speculative losses onto the taxpayer. Sovereign Debt to GDP ratios rose from 25% in 2007 to 125% in 2013. Never in the history of state finance had there ever been such a generous financial rescue. Never in the history of state finance had there ever been such a generous financial rescue. The Troika intervened and government increased taxation on wage earners while keeping corporate taxation close to zero. A parallel income tax was introduced called the Universal Social Charge. House owners were taxed, waste collection etc… Government taxation stalled with resistance to water taxation. Taxation on vacant properties and building sites was successfully stalled by speculative interests. The Irish property market sold property ownership as a step on an imaginary ladder to riches; this left many sitting on negative equity. Their long mortgages have turned this dream into a nightmare. None of this is evident in the property supplements of the national papers. Markets stoically refuse to correct. They have an ally in NAMA. With crisis came unemployment and more Irish emigration. This should have resulted in increased housing supply but the preliminary results of the 2016 census show how this supply was eaten up by immigration. NAMA exacerbated the situation by controlling supply, keeping properties (like Apollo House) and many thousands of residential properties off the market for years on end. When demand outstripped supply NAMA sold to vulture funds and real-estate investment trusts or (REITS) not to the people who needed the housing. Homelessness is a curious symptom of Ireland’s financial crisis. Paradoxically the crisis left NAMA controlling a vast stock of housing from bankrupt speculators. HSH saw this as a lever to end homelessness almost instantaneously. They used occupations to get the ministers responsible to pull those levers in NAMA and get the homeless people off Dublin’s streets. This has been only partial successful. NAMA was created post-crisis as the government agency to manage the fall-out from Ireland’s collapsed banking sector. Irish banks became good-banks and bad-banks. The not-so-good banks, including the worst bank in Europe, Anglo Irish Bank, were wound-up or nationalised. Others limped on but required government intervention. NAMA was the bad bank for property; it managed the contractual relations with bankrupt development firms and their overpriced collateral. NAMA was launched as a secretive government agency, effectively controlling nationalised property. For a time the Irish state managed the world's largest collection of golf courses; its hotel portfolio was impressive too. NAMA held one of the most overpriced portfolios on the planet. For a time the Irish state managed the world's largest collection of golf courses; its hotel portfolio was impressive too. NAMA held one of the most overpriced portfolios on the planet. Since then NAMA’s assets have been sold back into the private sector, the Irish government providing tax sweetheart deals to their international speculators. On 10 January 2017 the Irish national broadcaster (RTE) aired an informative documentary entitled The Great Irish Sell Off. Director Ian Kehoe exposed how vulture funds such as Lone Star, Cerberus, Goldman Sachs and Blackstone had been gorging on steeply discounted NAMA property. The documentary aired on national TV at the height of the Apollo House drama. Recently housing prices have risen again, driving up rents. Rents are higher now than in 2006 at the peak of the housing bubble costing roughly double the rates in Madrid. NAMA has played a role, first by holding housing off the market (waiting for prices to rise) and subsequently by selling large batches to vulture funds. Vulture funds like a rapid turn-around, whisking profits abroad using the same tax loopholes that the Irish government had created for this purpose. NAMA sales of batches of steeply discounted properties are not accessible to local buyers. This was a strategic decision by NAMA. The agency could have sold direct, bypassing the middleman, and brought down housing prices by flooding the market with supply. This choice would have also helped alleviate homelessness. On the negative side such a strategy would have driven further mortgage defaults and increased negative equity. Instead NAMA chose an intervention into the Irish housing market designed to sustain or drive up house prices. This increased homelessness too. The lack of supply of housing for sale or rent contrasts starkly with the preliminary results of the 2016 national census showing nearly 200,000 “vacant dwellings”. Meanwhile rents spiked 7.1% in 2016. Government interventions like these have architected Ireland’s financial recovery driving GINI coefficients higher (increasing the gap between rich and poor). While some experience recovery in high wage industries like software, corporate accounting and tax advice, and the booming pharmaceutical sector this has also meant well-heeled immigrant workers competing for an already diminished rental supply. Dublin residents have been squeezed between low wages and high rent, becoming the new precariat. Urban policy such as that which is practised by NAMA is by no means unique. David Harvey gave a 2015 talk in Britain entitled Slums and Skyscrapers, Housing and the city under neoliberalism. The distinguished CUNY professor calls this phenomenon “accumulation by dispossession”: he refers to the precariat as “urban discontents”. He notes that such policies result in a “crisis of affordable housing but at the same time […] building upper-end condos for all kinds of rich folk who are not interested in living in them they’re simply interested in parking their money in them.” There is “displacement and evictions going on in urban areas [on] a massive [scale]” but those who are evicted from their city often blame themselves failing to see the big picture. Those who are evicted from their city often blame themselves failing to see the big picture. Prominent HSH campaigners sat across from journalists. Oisín Fagan from the Irish Housing Network, two trade unionists: Brendan Ogle from Unite and David Gibney from Mandate but beside these three also sat actor Terry McMahon. Mr McMahon’s wonderful campaign video described his own experiences of homelessness. This creative combination of art and activism was put together by alternative-media activists including stand-up comedian Dean Scurry. Traditional media attended the HSH press conference. They received respectful, if occasionally hostile, replies. Irish media has a long history of downplaying activism. Many newspapers survive on the advertising income from real-estate supplements. Squatting stories can be out of favour, particularly when the occupation is done to shine a light on Dublin homelessness. The scale of the occupation at Apollo House and the fact that it was across the street from the headquarters of the Irish Times newspaper made the spectacular campaign difficult to ignore. Volunteer media coordinators like Rosi Leonard quickly realised that celebrity activism gave HSH what it needed to step over access barriers to mainstream media. High profile actors, filmmakers and musicians got involved. Hosier and Glen Hansard played live concerts outside Apollo House. Artists gave the HSH campaign an edge that was in its own way quite revolutionary. Film director Jim Sheridan appeared in a HSH video outside the General Post Office on O’Connell Street, the military headquarters of the 1916 Rising. In this video Sheridan tells the government to “bail out those who are sleeping in the gutter”, a wry reference to the bank bailouts. A HSH Go Fund Me campaign featuring Sheridan’s video received more than 170,000 euro. Groundswell support and volunteers went much deeper than donations. Groundswell support and volunteers went much deeper than donations. Irish emigrants abroad (locally celebrated as the diaspora) supported HSH from exile. They are not allowed to vote but they had a Facebook account. Emigrants voted with their dollars; one millionaire even offered to buy the building. Insinuations were made on the probity of Go Fund Me income but they were easily countered by organiser Oisín Fagan when he published HSH accounts on The Irish Housing Network Website. Human rights or property rights? The HSH campaign rallied the Dublin people around the human right to decent housing. They brought love, understanding and respect to the homelessness issue that transcended the brute interests of property valuations and the profit motive. Instead HSH looked toward rebalancing property rights and human rights in the Irish constitution in line with the EU social charter. HSH looked toward rebalancing property rights and human rights in the Irish constitution in line with the EU social charter. The two crises referred to above are two sides to the same coin. The sovereign debt crisis and the homelessness crisis were both the result of property speculation. Peter McVerry described the state of the housing crisis as the worst since the 1840’s Great Irish Famine. The current Fine Gael government has said they will address homelessness but they are mired in a whistle-blower controversy that covered up police corruption. Ireland’s homelessness is not just about macroeconomic or political issues. There’s also a brutal personal side reflecting a deep lack of hope in the Irish Great Recession. A heroin epidemic like a Trainspotting sequel rivals the dark days of the 1980’s. The European Monitoring Centre for Drugs and Drug addiction notes that drug-induced mortality rates were three times the European average in 2014 with opioid presence in nine out of ten drug deaths. Homelessness and the lack of adequate alternatives to private housing markets is particularly acute in Dublin. To say that the current neoliberal government coalition lacks the political will to solve this issue is a lesson in understatement. Instead they have recently instituted a first-time buyers grant which even the IMF has criticised as inflationary (and profitable for developers). A report by the Peter McVerry Trust asks the question as to whether Ireland “[had] a housing system, [or] a housing market?”; the answer is obvious, market interventions by the government drive the market up. Even recent rent controls allow increases well above inflation, while funding for new social housing was cut by more than 88% between 2008 and 2014. Government inaction on homelessness sponsors a private industry in temporary accommodation. Whole families live in a hotel room or sleep in Bed & Breakfasts. Although the Irish government adopted the 1996 revisions to the European Social Charter, it refused to ratify Article 31 (on the right to housing). Although the Irish government adopted the 1996 revisions to the European Social Charter, it refused to ratify Article 31 (on the right to housing). Article 31 deals with access to an adequate standard of housing, the gradual elimination of homelessness and accessible pricing for homes. Accessible pricing is blatantly at odds with government’s co-dependence relationship with property developers. Even now bringing accessibility to house prices remains off the political agenda. On 6 January, HSH presented its Emergency Housing Plan to Simon Coveney, government minister for Housing, Planning, Community and Local Government. Activists returned to Apollo house happy with “substantial agreement”. The minister was focused on trying to manage an orderly transition of residents from Apollo house into homeless accommodation. Willing to negotiate, Coveney had given various assurances on housing. HSH declared victory planning a Victory March for 10 January but details were changed due to legal actions from lawyers for the receiver appointed by NAMA, Mazars. HSH held a rally to defend Apollo House against eviction, a tactic they had learned from their visits to the Spanish housing activists: PAH. HSH held a rally to defend Apollo House against eviction, a tactic learned from their visits to the Spanish housing activists: PAH. 11 January was the date the High Court ordered HSH to vacate Apollo House. Residents left in taxis to take up minister Coveney’s “appropriate” housing offers. Some returned the same night describing their offers as “worse than prison”. The deadline came and went in an atmosphere of confusion and victory speeches. Apollo House would be given back to the government as directed by the high court but not until residents had been properly housed. By the next day all but one resident had received an acceptable offer. HSH decided to house the last resident with campaign funds, they returned Apollo house to Mazars without incident. The HSH campaign has been a partial success. It’s not over yet. Campaigners vow to continue; there is much to be done. A TV3 exclusive: Inside Apollo House aired on 23 February. A comment on HSH social media asks simply: Apollo 2?